Knit By God's Hand: I'm getting old... does Betty White work out? I thought about keeping it separate & did for 2 days... until my wise, wonderful, lovely friends Nathalie & Meranda got in touch with me & basically told me, "This is your life. Put it with your other posts"... & they are so right. I know these aren't everyone's cups of tea to read, but it is a big part of my life. I've been a girl who loves fitness & strives to eat healthier... & I'm also someone who struggles with staying on track & keeping weight off. I just love my friends reminded me that this IS my life. Even if its not so fun, though I do try to bring a little bit of humor to every post... ESPECIALLY when it comes to working out & weight. God KNOWS I need a sense of humor when it comes to that. I also know that I'm not alone in this. I know there are others out there with the same struggle. & you can support me & I'll be more than happy to support you. So once again, while I'm not training to run another half marathon.... though when I heard my neighbor was doing one in the fall, my ears went up & I was like, "Do I want to do that race?"... Gaaahhh - its always in my blood. & I dont get it because I still dont consider myself a runner. Anyways - nope. No races ahead. I literally started the 21 Day Fix Extreme last week & already got through the first week & know its not the plan I want to be on. So what am I starting now? WHO KNOWS. I literally was praying about it at lunch on what God wants me to work out with. Let's just count this new beginning as a physical AND spiritual beginning I guess. I'm just excited & anxious to get back on track. I have started watching my food intake again & lost 2.5 lbs the first week... which sounds wonderful, but then you have to consider, I've gain 17 of the 40 I lost back. GAHHHHH. But I'm just ready to get healthy... especially because I got the news that I'm getting old. No, really. I am. I got the report in after 6 tubes of blood were drawn that not only am I WAYYYY into perimenopause stages, but nearing menopause. 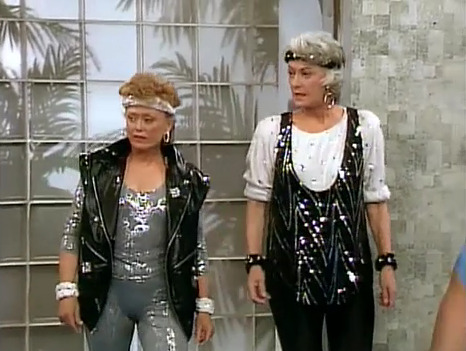 OH MY WORD... where's the Golden Girls because I need to move in. or wait, are they dead? ...No, there's still Betty White. 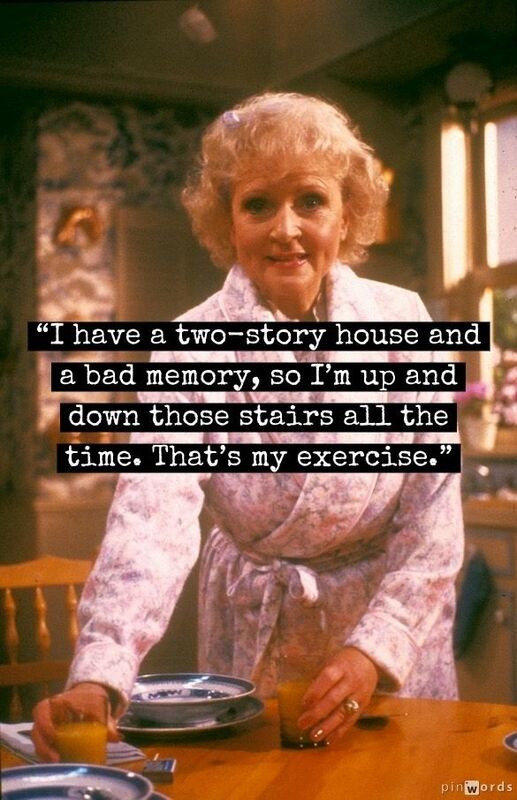 I'll move Betty White in with Ricky & me. Seriously - my levels - dont ask me all the names - estradiol & progesterone... Is that right? I'm not a nurse - they both were 0.5 on one & zero on the other.. the nurse called me & said, "The doctor said she'd be surprised if you have a period again".... aka, "you're old"
I'm not counting them out yet personally.... I went 3 months without one & then started right back up again. Hang in there old body.. .hang in there. & I'm a big researcher on such things that involve the body so the biggest thing I've been reading is how important weight training is at this stage of life. Get those muscles tones up, burn up the metabolism that way. I'm all for that. So while I've always been a cardio girl... (hello other children of the 80's where leg warmers & Jane Fonda rule).... I'm going to have to rethink my workouts. I'm focusing on weights. Gonna run this old body till she cant run no more! Thats for sure!!! What do you like to do - cardio or weight training? Man, I need to get back on the diet and walking train! I have SO fallen off and I've got the body to prove it! 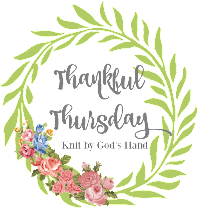 This post is so timely for me, Rebecca Jo. I've struggled with my weight for years and really fell off the rails when my depression consumed my life. And even though I no longer battle depression daily (but you know how it likes to pop up and say hi occasionally) I still treat my body poorly by eating badly and never exercising. I'm finally changing those old, bad habits, although this time, I going slowly. Normally I make grandiose (i.e. super unrealistic) plans that I promptly fail and quit. But I'm making real changes and really exercising again, not just thinking about it or giving lip service. We both can do this!! And every time I get hot or sweat for no reason - I think, here she comes. I got my period early so I suspect menopause will come early too. I won't mind saying good riddance to my period but everything else that comes with it - nope. I'm a runner at heart but boyyyy is it fun weight training! And personally, I think the body looks so much better with a little muscle tone! I'm studying wellness + fitness right now, so I totally get where you're at with trying to decide what to do. I have lost my motivation because i'm so busy with school & work.. but I know when I'll get it back, i'll probably choose weight training! Also, you are definitely a runner! Your exercise and fitness posts always inspire me. And, trust me, I need A LOT of inspiration to get off the couch and moving! Your honesty rocks! I like seeing your life on one blog!! I am loving my weight training. I like the cardio, but girl, we need weights for our bones! I like seeing muscles, which is why I'm so happy to be lifting again. Plus, we get big calorie burns with weight training. Why don't you start the Body Beast? You could do the Hammer and Chisel again too. It had a blend of cardio and weights. 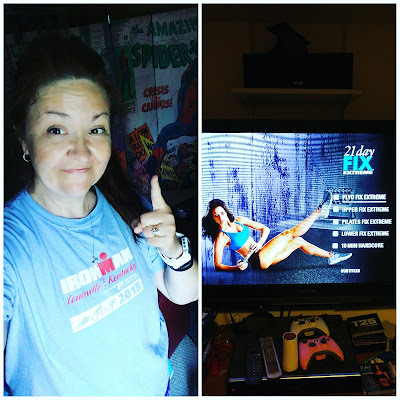 Good luck with your 21 day fix! You always do amazing when you put your mind to something, so I have no doubt you'll do well. FYI Betty White would be a great addition I could chat it up with that woman anytime she is hilarious, love her! I'm so glad you decided to keep everything in one place! 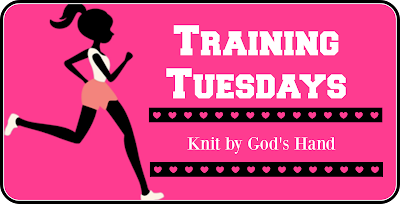 Perhaps you can title the blog "knit and train by God's hand"
Just look at all these comments and all the people that you inspire every day just by you being you! I started into menopause at 48. Stopped periods, started again. Stopped again. Finally done - completely done - by 50. Then came the hot flashes. :) And the weight gain. When I was in my 30's I started running and lost 50 pounds in a year. I was able to keep it off until I hit menopause. Ugh. I think you are doing the right thing by asking the Lord what you should do. He created you and knows exactly what you need! Being motivated to get back on track can be one of the toughest things in the journey, and you've nailed that, so congrats! And, yes, I attended a seminar by a doctor/researcher (Dr. Vonda Wright--I think she's written some books) who researched aging, and she said that weight-bearing exercises like lifting weights, plyometrics, and running are the best things to do to help us age gracefully. I definitely need to build some strength. I'm doing Weight Watchers for weight loss, and I just started an arm routine (seeing as how I can't walk, there will be no cardio for a few more months). I started menopause really early & I actually think I might be done already at 53. What? That seems crazy! My doctor put me on Adipex-P a month ago in hopes of helping me get some weight off so it will get easier to exercise. I have plantar fasciitis, arthritis in at least one ankle, a bum knee from wiping out of the ice at work once too often, and currently a pain in the neck/shoulder that is affecting my back now, too. I have to get x-rays of my neck and back to make sure there's no disc involvement, that it's all muscle/tendon/ligament/whatever. If it's not, my Total Gym is totally coming back out and getting used again. I lost 12 pounds the first month on the pill without making any effort...imagine what would happen if I actually exercise! On the menopause thing...I got really messed up in my later 30s and early 40s. I had my period virtually every day and the days that were when my actual period was supposed to be I'd hemorraghe. It was awful. I ended up getting a D&C and then they put me on Provera to force my body to have regular periods. Around 47 or so the periods were only coming once a year or so even with the meds so I quit taking them and that was the end. My doctor had a fit, said I was too young for menopause, but for once I totally ignored him and I've been fine. 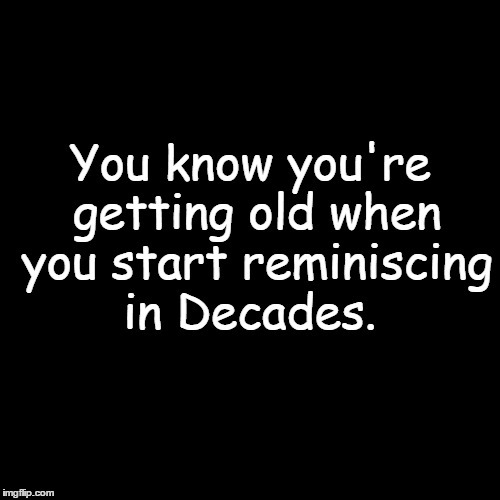 I had one year of the worst emotional ups and downs...totally cried all the time about everything and anything...and a few pretty mild hot flashes. That was it. Personally, I'm glad to be done with that, but maybe that's because the last 10 years of it were pretty awful for me. 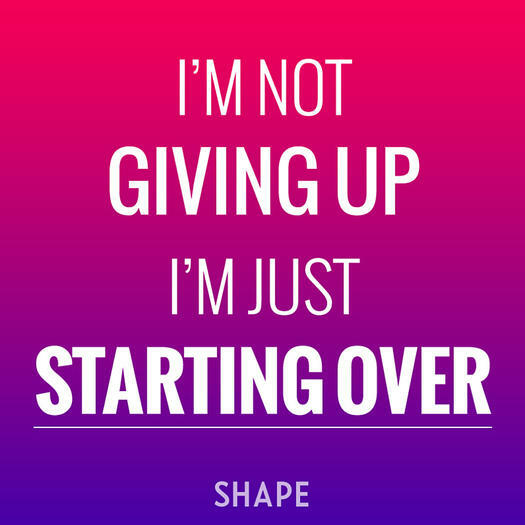 I like that quote you shared about not giving up but starting over. I feel like I'm constantly doing that now that I really struggle to keep weight off too. For me, the key has been to find group classes I like (hip hop aerobics and boxing with body bags) in between training for races. I love running and hope I'll always love running, but I go through seasons of it, and I think it's better to switch things up anyway. The classes are good to go to because I've been going so long and so consistently that people know me and talk to me, so I feel a bit more commitment to actually go, which can help when my motivation is down. Basically, I've just marked on the calendar that those two nights are always blocked off for my exercise classes, and my husband's really good to support me in that (like, he won't schedule meetings or anything for those nights). It makes a big difference. Good luck with your refresh!